We are now 10 hours to departure for Oshkosh. I wanted to send this note out as a heads up to anyone driving in to AirVenture. We are now in the process of setting up registration for Corvair College #24, November 9, 10, and 11th in Barnwell, S.C. It will be the third year we have had the event at this venue. Corvair Colleges #19 and #21 were very productive events hosted by P.F. Beck and crew. This year, I want to get a lot of builders jump started early, as I would like to have a record number of builders and running engines at #24. One of the ways for builders to get a jump-start is to have us take care of the case assembly in advance. At the College, everyone can take an hour to watch a case assembly to understand the process, but I would like to have a number of builders with pre-assembled cases go right into pistons and cylinders. This also has the effect of staggering the times that builders arrive at the run stand use on Saturday and Sunday. Above, a 3,000 cc assembled case with a Weseman billet 5th bearing. The main bearings, cam, gears and nitrided crank are already installed, along with the 5th bearing. This is a very strong jump-start on an engine build. If you are one of the builders interested in this, bring your core case and crank to Oshkosh, and we will get started with your build. Even if you are unsure if CC#24 is possible for you, we can always ship the case to you when it is completed. If you are reading this, but Oshkosh isn’t in your plan, send us an email, and we will get back to you after the show and work out shipping your core parts in. Even if you have already sent your crank through Moldex, I will be glad to assemble the case and deduct the price of the crank and / or any other parts you may have already purchased. We are flexible on this, we just want to get a new group of builders launched. I have about 20 cases and 9 cranks that are fully prepped, including the new stress relieving before nitriding process. If any core case or core crank has a serious issue, we can just replace it from my collection at modest cost without delay. Dan has the bearings in stock at this time, so we will have the initial cases assembled 30 days after returning from the show. The price has a number of variables, but first, what they will all have in common: Clean case that passes inspection and has the studs tested. The crankshaft will be magnafluxed, threaded, stress relieved, ground nitrided, balanced and polished. The main bearings will new and matched to the crank. The billet 5th bearing will be installed and doweled to the case. The case will be painted your choice of colors. We are 30 hours away from leaving for Oshkosh. Dan and Rachel Weseman are also heading up, and we will both be at booth 615 in the North Aircraft Display area, between Zenith and Vans. The Wesemans are bringing The Panther prototype airframe to display all the progress they have made in the few short months since Sun N Fun. Because they are good friends and we wanted to do something to support their new effort, I offered to assemble the 3,000cc Corvair that will power Panther #1. Here are a few photos of the completed engine. It will also be on display at the booth. 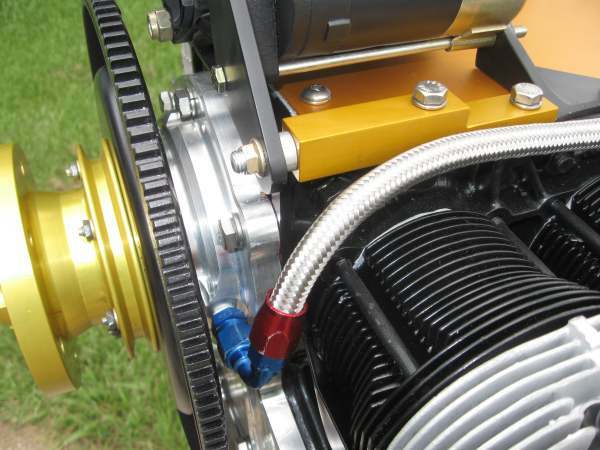 Above, the engine is a 3,000 cc engine with a Weseman bearing, Falcon heads and all of our Gold System Parts. The engine features some of the latest developments and a unique fuel system. The pictures of this engine are a good visual complement to our previous post on 2012 Engines For Sale. Other than the intake and the injector, this engine is the same as the ones that we assemble for builders. This engine is also an excellent blueprint for anyone building their own engine from our parts. The valve covers are one of our powdercoated sets with welded on oil filler and breather lines. Above, a rear view of the engine. Behind the harmonic balancer is an alternator driven off the crank through a flexible coupler. It is a joint project that Dan and I have been working on. It retains the balancer and cannot put bending loads on the crank. I have never been a fan of belts on the back of the engine, but this system does not use one. The alternator is the same Yanmar unit we traditional use on the front of the engine. The set up will be flight tested after Oshkosh. The intake is a custom stainless part made in our fixture so that it mates with our traditional welded on head pipes. On the bottom of the intake is the Precision mechanical fuel injection unit. Dan has designed the Panther to have tremendous airframe strength. 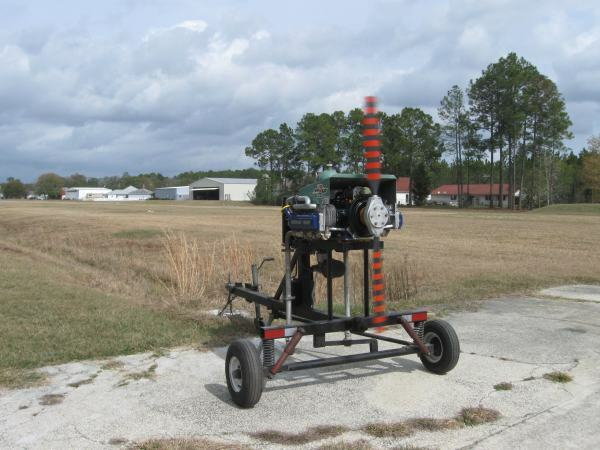 The test wing took more than 9Gs at gross weight in a sandbag test conducted after Sun N Fun. 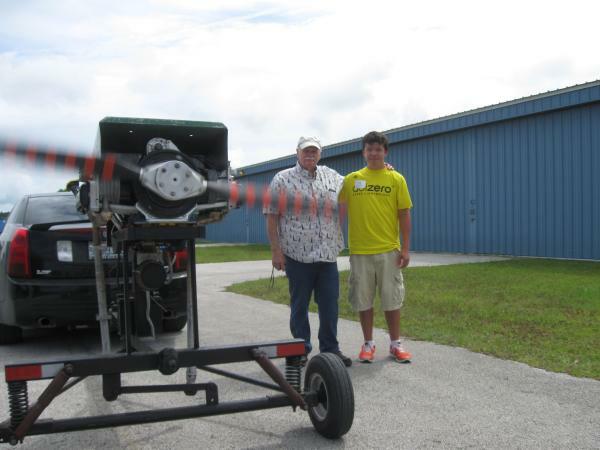 Although Dan designed the plane to be easy to fly, it will be capable of impressive aerobatics. With the intention of ultimately being able to fly it with inverted systems, Dan has selected the Precision injector as his fuel delivery system. Here is a good frontal view of the Corvair. It is only 28″ wide. This is 4″ narrower than an O-200, 6″ narrower than an O-235 and several inches narrower than a VW. The Corvair is a tough compact package. Six cylinder engines will always end up as a smaller package than a four-cylinder one of the same displacement. This view shows our new simplified adjustable starter motor bracket that eliminates the previous link arrangement. The single oil line runs direct from the Gold Oil Filter Housing to Dan’s bearing. Braided stainless hose and full flow AN hose ends look and work great but are not as expensive as people think. This hose was easily assembled from $36 in parts. Of course Dan’s plane is going to use one of his bearings. Originally a heat-treated casting that matched the finish of the Corvair’s cast case, the Wesemans switched to CNC machining the same design out of solid billets of aluminum. As part of their commitment to keeping aviation affordable, they did not raise the price when making this improvement. It goes without saying that this unit is entirely made in the U.S. out of U.S. material. With well over 200 of these bearings in the field, it is by far the most popular bearing. It has three strong cards to play: It is by far the lowest cost bearing, it is retofitable in the field to existing engines, and it is readily available, as the Wesemans now have them machined in large groups to have them on the shelf. The photo is also another good look at the simplified starter arrangement. We have four-part kits for engines with Weseman bearings that consist of the new starter ear, two machined aluminum spacers and a pre-made tail bracket that allow any of our starters with a bolt on ear to be adjustably mounted on an engine in 15 minutes without fabrication or drilling. We will have these sets at Oshkosh. Over the years, we’ve built more than 100 high quality production engines for builders who opted to buy the finished product from us. 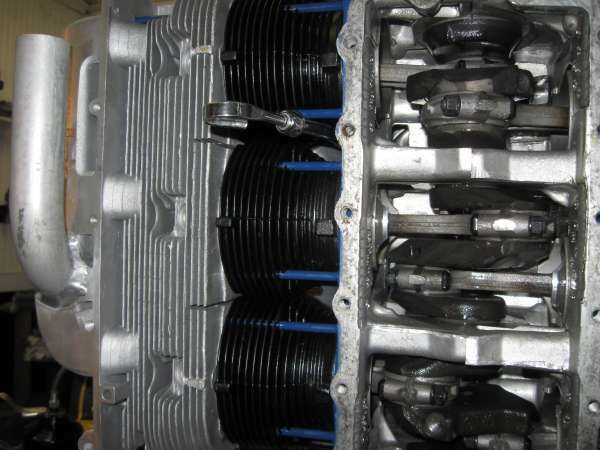 Some of the best known flying Corvair engines were built in our shop. As a policy, every one of these engines are test run and broken in on our dynomometer/run stand. 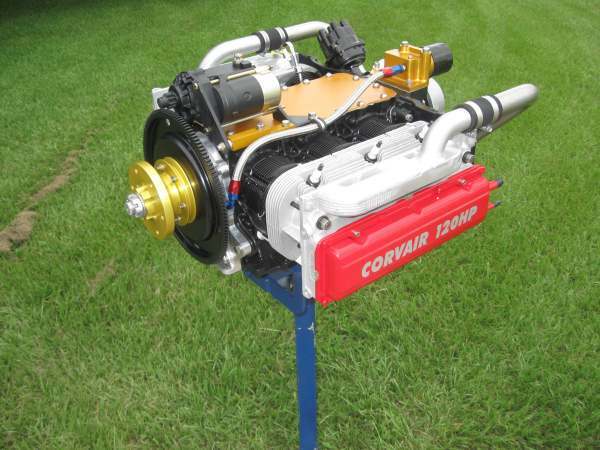 A review of our FlyCorvair.com and FlyCorvair.net Web sites will show photos of dozens of engines we’ve built that are now flying. Our great experience with Corvairs, our use of only the highest quality parts and the test runs have given us a 100% track record with production engines. This record makes it easy to stand behind engines we’ve built. By and large, people who have selected our engines, installed them on their aircraft and operated them as we recommend have had to do no work other than regular oil changes and spark plug replacement at 200 hour intervals. 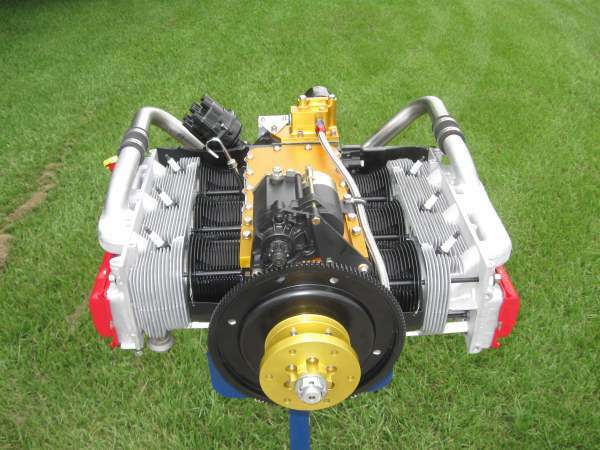 All of the engines we build are completely overhauled and modified with state of the art components made in the USA. Every engine has a forged crank that has been Magnafluxed, stress relieved, ground, balanced, nitrided, polished and balanced. Our engines are built on the readily available Weseman 5th bearing. We have built a number of other engines using our own bearing and the one from Roy’s, and we will gladly speak with anyone about using either of these bearings. We use the Weseman bearing as our standard offering because it is well proven on more than 100 engines and it is economical. Our bearing and Roy’s add $1,000 to the price of an engine. Additionally, all of the engines have forged pistons, and the 2,850 and 3,000 have new cylinders. (The 2700 cylinders are re-bored GM originals.) They have forged rods with ARP bolts, harmonic balancers and high volume oil pumps. Each engine has dual ignition and electric start with a 22 amp alternator. 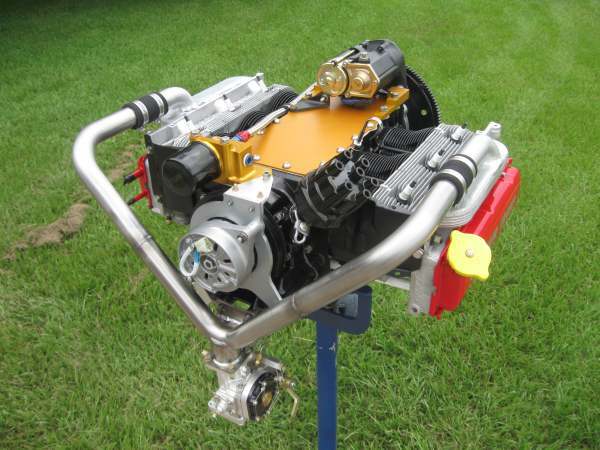 The engines have our gold oil system and the builder’s choice of billet or welded oil pan. (Heavy duty oil cooling systems are a popular $600 option.) The only major component not included is the carburetor. While any of the engines can be used on airframes as different as a KR-2S to a Zenith 750, the carb must be a good match for the airframe. For example, aircraft with low wings and fuel pumps require MA-3 or Ellison carbs, while gravity feed airframes can use a wide array of carbs, including the affordable Stromberg. The Corvair has flown on more than 15 different carbs, and we will be glad to assist you in choosing the correct one for your airframe. Above, an engine we assembled for a builder at the beginning of 2012. The engine is on our run stand outside our hangar. Every engine we assemble is test run and broken in on our run stand. 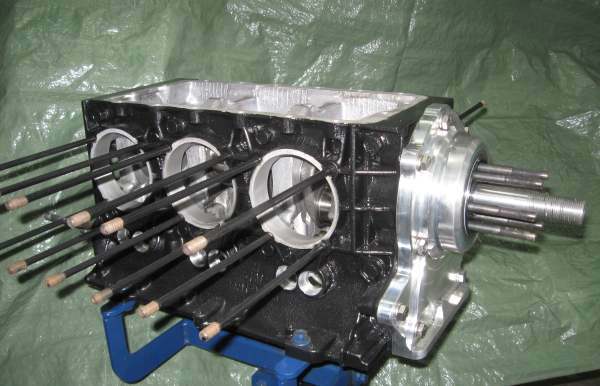 The engine’s performance is carefully evaluated against dozens of others we have built. This test run allows even fine details such as the hot idle regulated oil pressure to be preset before the engine is delivered. 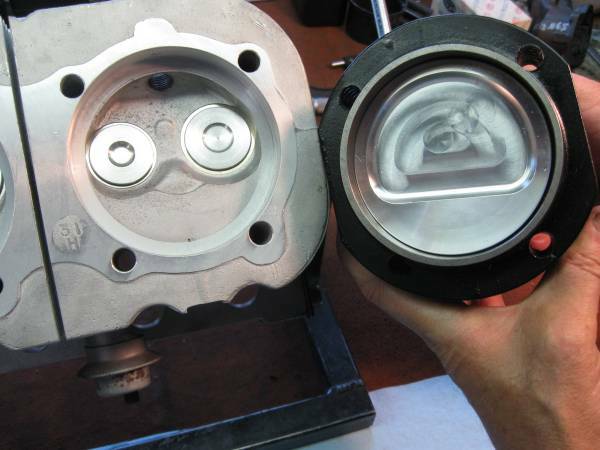 Above, a picture of a 3,000 cc dished “Dual Fuel” forged piston. These are made in the USA to our exact specification. These pistons are the heart of 2,850 and 3,000 cc Corvair engines. They allow these engines to run equally well on 100LL or high grade automotive fuel. The design maintains a very tight quench area to the head while keeping a moderate static compression ratio. Many alternative engines have electronic elements and valve designs that are not compatible with the high levels of lead in aircraft fuel. Others have excessive compression ratios that make operation on fuel below 100 octane a serious detonation risk. No such issues exist with our Corvair conversions. When Corvairs were built, all automotive fuel was leaded; in the past 30 years they have proven to operate on unleaded fuel. Our 2,850 and 3,000 cc engines have these special pistons to maintain the ability of operating on either fuel. Corvair engines are not bothered by ethanol in fuel. The head in the picture was remanufactured by Mark at Falcon Machine. Above, a look inside an engine during assembly in our hangar. As a direct drive, horizontally opposed, air cooled engine fed with a single carb, the Corvair engine is a model of simplicity and reliability. 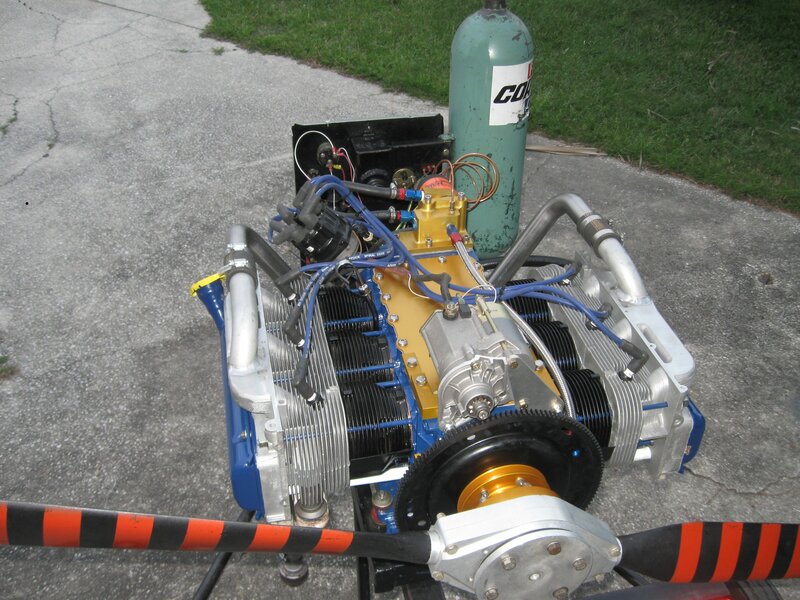 It has been powering experimental aircraft since 1960, and we have been continuously working with them since 1989. Many people new to homebuilding are taught by magazines to look at things which are “new and exciting.” All of my work in the past 23 years has been aimed at testing and developing proven methods and systems that builders can count on. “Old And Flight Proven” is the opposite end of the spectrum. It is my personal philosophy that many more homebuilders have been served by “Old And Proven.” Builders who understand this fundamental truth of aviation naturally gravitate to our work with the Corvair. Conversely, any company that makes its living just on complete engines, especially if it is an LLC, has an enormous incentive to cut corners on every part inside their engines. The only way they make money is by charging more, lowering their cost, or both. In tight economic times, price has a ceiling, so lowering the cost and cutting a few corners is the way to go. They can do the math, and every dollar they will ever make is based solely on this differential. They know that 9 out of 10 engines they sell will not go flying in the next 3 years. Organized as an LLC, they can walk away from the business without any financial obligation to their customers. If you’re new to aviation this may sound far fetched, but it is actually how the majority of alternative engine companies have been started, operated and dissolved in the past 20 years. If you are a builder interested in discussing an assembled Corvair for your project, let me suggest the following; take the time to read the stories in the links above. Also get a look at our main reference page, FlyCorvair.com. At the bottom of the main page is a search box that allows you to find any subject. The site has well over 1,000 pages of text. You don’t have to read it all (some of it is historical or dated), but you will find an excellent introduction to the engine. Then, write me with any questions you may have. Please include your phone number, and a good time to call you. We keep all the information confidential, but I find the phone a much faster way to cover builders’ questions. Understand that we get many emails every week asking about buying an engine. 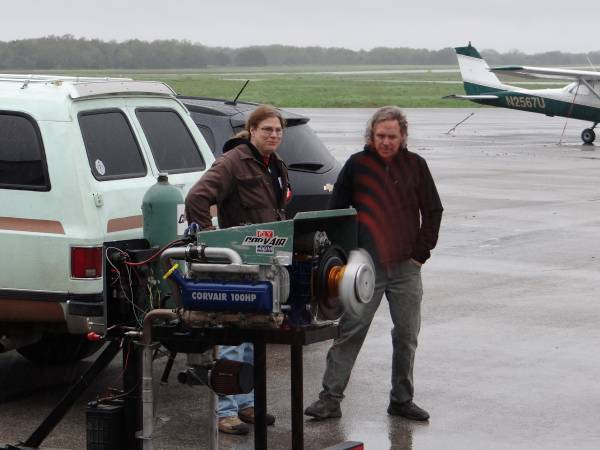 Some are scams, others are from 15-year-olds, some are from people asking if the engine will power a Lancair IVP, others asking what type of antifreeze goes in the engine. There may be one real builder in the group. In my experience, the real builder appreciates 30 minutes on the phone, and all the others want to have long protracted email exchanges. Set yourself apart, send your phone number.